So, we’ve played three rounds of League games and it’s as case of so far, so good for James Horan’s second stint in charge. We’ve won all three games, we lead the Division One table, we’re level on points at the top with Kerry but ahead of them on points difference, as we’ve made our best start to a League campaign since 2006. It’s fair to say we didn’t expect this. The widespread belief before the League began was that, once again, we’d be battling against relegation. We certainly didn’t think we’d be top of the table after three rounds of games so we’ve every reason to feel pleased about how we’ve done to date. The three games played so far have given us a mixture of positives as well as a few negatives. As you’d expect, three wins from three mean there are more of the former than the latter at this early stage in the year. On the positive side, the obvious first point to make is that we’ve discovered the happy knack of winning matches in the League. We’ve more points on the board already this year after three games than we garnered from all seven NFL outings in 2018. We’re starting to get used to winning League matches for a change. The victory up in Omagh – especially the manner of that win – was a pleasant surprise. It’s surely of greater satisfaction, though, that, after a truly abysmal run, we’ve started to rack up wins once again at MacHale Park. It’s far from a fortress for us yet and the heavy sod combined with the tight confines make it a pitch on which we struggle to perform well regardless of who we’re facing. It’s encouraging nonetheless that we’ve begun to rediscover how to win there. The way James has been able to blood so many new players – with seven lads having made full League debuts so far – and the encouraging performances put in by all the debutants, in particular Michael Plunkett, Fionn McDonagh and Brian Reape, also augurs well for us. This isn’t just experimentation for the sake of it either. The new lads have been introduced alongside a solid core of experienced players, whose own early season form has been good. The mix has, so far at least worked well. The injection of new talent has certainly deepened the playing panel and it has given us different options all over the field. It’s still very early days, though, for the new lads who, in truth, are only starting to bed in. We can’t be certain how many of them – if any – will be pushing hard for a place on the first fifteen come summer. The early signs are, however, good. In his Mayo News column this week Billy Joe Padden used the term ‘Horanball’ to describe how we’ve been playing so far this year. James has always put an emphasis on high workrate, skill execution and, yes, results. If this is ‘Horanball’ then we’ve seen at least some evidence of it already in the three games we’ve played. I’ve always felt that James’ second coming was never going to be about reassembling all the players he’d managed before. We’re already seeing his appetite to use exciting raw talent but that doesn’t mean that there isn’t a place for a revival of some of the traits we saw in the 2011 to 2014 era. For me, the most visible sign of this retro style has been the way Aidan O’Shea and Donal Vaughan are being deployed. Aidan isn’t – despite what some pundits might tell you – operating as a conventional no.11. Instead he’s dropping deeper and working hard to hold up opposition attacks and force turnovers. Once he does this, he’s moving the ball on rapidly. To me, this reminds me of the deep-lying role he played so effectively for us back in 2012/3. Donie never, it’s true, operated as an out-and-out midfielder in James’ previous tenure. But he did frequently barrel forward, chest out, giving and going, a vital link in the middle third. It’s a part he appears to be reprising with effect once more. I’ve no wish to stoke the goalkeeping debate but, on the evidence of the three games we’ve played so far, it’s clearly a discussion that remains open. Is Robbie too scarred from big day mishaps to be a realistic Croke Park option for us should we find ourselves back there? Can David Clarke sort his restarts so that he’s giving his men a better than 50:50 chance of claiming possession from his kickouts? I don’t know what the answer is to this conundrum. But I do know it’s one that James Horan and his backroom team need to sort ahead of the summer. Midfield is also a bit of a concern. While both Donie and Diarmuid are going well, primary ball winning isn’t their strongest suit. Aidan can, of course, field with the best of them his lack of mobility means there’s only so much he can do, though his presence there does certainly help. It was, then, good to see Mattie Ruane getting a run there the last night but, of course, it’s way too soon yet to judge whether or not he’s ready this year for a summer in the engine room. There’s surely still a role for Seamus O’Shea as well so maybe how he and Mattie share that job between them could be key. It’s certainly an area that needs further work. Of course, our restart strategy is relevant here too. The range of kickouts we use impacts directly on the ball-winning load the middle third will be expected to carry. That in turn brings in the winning of breaking ball and who is best placed to contribute there. Happily, we’re far from bereft of options in that regard. Free-taking is another issue we need to sort conclusively before the summer. Once he returns to the fray, Cillian will, once again, be our go-to man in that department. While he’s still a very good man to have on placed balls, Cillian is no longer the best in the game. Coming up against the likes of Dublin – for whom Rock rarely misses – and Kerry, where young Seán O’Shea is popping over frees for fun, we need to be nailing every opportunity we get in this area. So we’ve some things we can be happy about, with other aspects still a work in progress. That’s not surprising – it is only the middle of February, after all. What’s good is that the three wins we’ve got so far in this League don’t appear to have given us any inflated notions about our standing in the world. It’s widely accepted by supporters that these wins came against the easiest opposition – admittedly, there’s some after-the-fact reasoning about the Tyrone win but anyone who was in Omagh will readily admit that they were pretty awful that day – and that far harder assignments now face us. The next three games are all huge for us. While we’ve given Dublin the biggest tests they’ve faced in the Gavin era, we’ve never beaten them, not once. You have to go back as far as 2012 – yes, back to the Horan Mk I period – for our last win over them. Kerry, by contrast, have got the better of Dublin in the League twice in the last three years, including in the Division One final in 2017. So the Dublin game is a big one for us. So too, however, is the match against Galway a week later. Back on our stodgy, suffocating home ground, we’ll be up against a team that has really got under our skin in recent years, one we haven’t beaten in League or Championship since 2015. Yes, that one will also be a big test for us. Then it’s Kerry, arguably – in light of their win over Dublin the last night – the form team of the League so far, down in Tralee the night before St Patrick’s Day. That one, though, is sufficiently far away to park for now. In any event, how we get on in the intervening two matches – and how they do in the meantime as well – will largely dictate how we’re feeling about ourselves as we point ourselves towards Tralee. The bottom line, then, is that, while we’ve made a good start to 2019, James Horan’s charges have yet to face their first proper challenges of the year. How his team fare out in those will tell us a lot about how we really are shaping up. These upcoming tests will also give us at least some indication of what we should realistically be expecting from the team this year. Cillians ability from placed balls seems to have regressed in the last few years as mentioned above. However given his young age and undoubted technique i think some of this may be on the mental side of things.Since he has now had a good break and with the new feel good factor in the squad is it possible he might get back to top form from placed balls? I think it could be. Last Saturday was the first time this year that at least one kickout didn’t go straight over the sideline. It is also the first time we didn’t look vulnerable under the high ball. * At the half-way stage, one thing is clear: the Connacht championship is going to be some battle this year. We beat the Rossies, but they will claim – with justification – many absentees that night. The addition of Conor Cox has added to the mix there for sure. And, Galway can be quite happy too; missing many, not brilliant performances, but an away win in Monaghan and 4 points on the board. Leitrim are atop division 4, London beat Wexford and only Sligo, so far, have slumped. * To put our kick-out woes into perspective, I’ve noted the performances of all three opposition goalkeepers, and all, to my mind, have been excellent. O’Malley for the Rossies was able to ping to his man even against the storm; Morgan, well what can you say – 16th man? Galligan too was excellent at finding his man consistently. Don’t know what Slingerman can add, but he must be given a go. * On McHale Park, all we’ve got to do is keep winning and we’ll be able to manage the pitch. We didn’t lose many in James’s first term, so why not get back to winning ways, as we have done so far. In that sense too Galway are a good scalp to aim for. * Placekicking has been ok; Doc’s blips came when we played our best football from play. Evan will be a loss there, but Conor Loftus or Brian Reape could surely contribute. * Pace, pace pace. James has worked on this for sure. The team is really pacey – Tyrone game in particular. We are capable of mounting attacks and have scorers from 2 to 15, 1 to 15 including Robbie. Harry, Keith, Leroy, Padd D, Boyler, all bombing forward and Reape, Diskin, McDonagh, and Tracey bounding out to balls is all quite exciting. * Finally, the mark. Seems to be a feature early in games and then is forgotten about. Still it can give us options. I particularly liked the way Aiden made his mark and hit his point. Let’s not get carried away with ourselves, put roscommon Tyrone and cavan together and they would not beat Dublin or Kerry. Just as man utd found out the other night Cardiff or Fulham are not PSG. On the plus side its great to see the panel being strengthen with all the younger lads getting a chance and taking it. The connacht championship probably will be the most competitive in 2019 should be very interesting. Excellent summary Willie Joe.. you’ve covered all bases there. The goal keeper debate will continue for some time yet but the way the game has gone, and as crazy at it may seem, the kick out strategy/ability trumps everything else including commanding the square and shot stopping ability. If we could clone both players into one we would have the perfect keeper. The stodgey surface of MacHale park in its current size and condition along with the brand of football we play will mean that it will never likely become a fortress for us.. but it is a good training ground on toughness if nothing else. I would have preferred to play the Galway game straight off the back of having played Cavan and then go to Croake Park but either way these games are key too seeing where we are at. A good assessment at this stage of the competition,and I agree with most of it , u es all the games remaining will be tough,I am sure James and all are aware of that,we need to more efficient up front,use Aiden more in around the D ,and the lads with pace to feed off him,and try and reduce the amount of turnovers,,hon. Mayo! Agree there Toe to Hand. if the kickouts are 50:50 then you’ll always have more shots to stop, more kick-outs to make. If you can improve the odds of those then you make it a problem for the opposition midfield, defense and ultimately your opposition keeper has more to worry about as regards high ball into the square and the shot stopping. Thanks Willie Joe. An excellent summation. Great to get 3 wins. Great to start winning at home. What does concern me though is the value of those wins. We will only find out over the next few weeks and Summer. Recent years have shown teams like Donegal, Monaghan and Roscommon thrive in the league with young players, but the cupboard being empty come the Summer, once fitness levels were more even across teams. I don’t know if this is an issue for us with our young players? They have to be a few years away from the top in terms of S & C work. For me a Connacht title and a Super 8 win is the realistic target for the year. I do not see us as All Ireland contenders. We are bridging the gap between the lads of 2011 and 2019. To win Connacht will take beating two of the top 8 teams in the country, and only Dublin have beaten Galway the last two years (the Monaghan game really was a dead rubber). It is doable though. I would like us to target the league. Next Saturday will be very interesting. If there is an issue with his kick outs I cannot think of a better man to sort that out than David Clarke. I agree making fool hardy assumptions on where we are at in Feb is a losers game. We are in a great place with the squad, good rotation in all positions and a few great players to come back. @PJMcManus, kick outs are so key and Clarke’s aren’t up to scratch, that cannot be argued against. If he can’t do it against Cavan in Castlebar he is unlikely to do it against Kerry and Dublin. However, now that teams are more practiced with claiming marks and making passes from the kickout mark the kickout has taken on even more importance. David Clarke is not going to majorly change his kickout at this point in his career. He has by definition a high trajectory, slow dropping kickout. We are missing out on marks we can claim ourselves and we are more vulnerable to the opposition breaking our kickout or claiming marks on it. If you want to reduce goals conceded the most effective way is to dominate posession. Many goals that are scored are unstoppable anyways, so it wouldn’t matter who was in goals. Then, in terms of our attack, we have seen Robbie Hennellys kickout being the launchpad of attacks. An excellent summary your article Willie Joe. The Dublin and Kerry games will really give us a better view on where we are. On the goalie debate I have been a fan of David Clarke and thought replacing him against Dublin was a bad mistake. However, his kicking out on Saturday night wasn’t great and caused us real problems. Mind you our outfield players didn’t win much 50/50 balls either. I hope he can improve. Otherwise James Horan will have to go with Robbie Hennelly despite his unenviable history in Croker. The next game is a very big deal for us. The dubs will be going all out because they need the points and they will be doing their best to put us back in our box. Whatever about winning, which would be great for morale, we certainly need a good performance and above all we need to avoid a heavy defeat. Barry Cassidy the ref for the Dublin game. he’s one of the worst refs in the game at the moment. A few points caught my eye. First was the issue with McHale Park pitch. Is there no way that the surface can be improved to dry it out and harden it up? Could it be covered when not in use? Its clear as day that the team approach JH encourages suits fit fast guys who really need a proper hard fast pitch to play on that suits their style. Its the same style for Dublin and Kerry by the way. But they do have these facilities when required so its another big loss that we are falling behind on. Second is a shot of realism. Everyone on the podcasts concurred that Tyrone were a good bit off the pace. So it wasn’t a level playing field and although the result was fantastic and much welcomed the reality is that Dublin will be a far bigger test in Croker. And they will be the real benchmark for these new Mayo soldiers. Finally my tuppence worth on the goalkeeper saga is that we have to live with what we have. Right now our 2 options are D Clarke and Robbie. Both have strengths and weaknesses. It would be better to develop alternative outfield options for whichever of these is going to be used rather than concentrating on improving either of these individually. Because at this stage their overall styles are not going to dramatically change. I’m going to cause outrage here, but stopping people coming on to Machale park after a game,might go someway in helping its long term improvement ? Cue the screams of ” but what about the children” ! I have seen absolutely nothing to suggest that Robbie has anything more than average kickouts. And that is an assessment of his league form. The last big game he played in, he unfortunately demonstrated an incredibly poor display of kickouts in 50 minutes or so. I am absolutely baffled that this is even a debate. Even if it were true that his kickouts were better (which I don’t), it is absolutely marginal and it would still be lunacy to pick him over Clarke. Looks like John Small will be suspended for our game against Dublin due to the brawl after the Kerry game. Hard to know if that’s even a positive for us. Jack McCaffrey will probably start now. It’s a great start but I’m a bit worried that we are still not settled on full back even tho Ger is making a late run at it, midfield are athletic and pacey but we are being outfielded regularly and we are still too reliant on Andy God bless him. It’s brilliant to see the new lads and all but these next three games will tell a tale. Perfectly summed up WJ. Lots to be positive about, but we also need to be realistic about where we are and where we might end up in the summer. Right now I’d take a Connacht win and some positive performances in the Super 8’s, so long as we are continuing to blood some new players in the process. I’d want to see Plunkett, McDonagh, Reape and possibly Diskin getting valuable championship experience this summer. Last year was a missed opportunity in that regard. In terms of the league, I think we need to remember that our early championship exit last year is playing a big part in our positive performances. We look fitter at this point than we have for the past 6 or 7 years. Beating the Dubs would be fantastic, but I genuinely can’t see it (although I thought the same about Tyrone). So long as we are competitive and give them a good old rattle, I’d be happy enough. The Galway game is huge though. I know we’ve said it before, but we really need to get back into the habit of beating them. I’m sure Horan will be targeting this game, we have to lay down a serious marker before a potential Connacht final meeting. The other 2 games in the league are very winnable. I know Kerry are in good form, but we can get a win down there. The Monaghan game will be tough, especially if they are fighting to stay in the division at that point. If they’re not, and we have a potential final place in our sights, I’d fancy us there as well. To sum up, we have to be happy about where we’re at. Horan seems to have the lads fired up (particularly the older lads, who clearly respect him and would run through walls for him) and we can see a definite style of play developing. It’s exciting to think how this pacy, hard running style will develop on the drier hard sod during the summer. Regarding the pitch, I was shocked last year when I walked across it after a match. In addition to the smaller holes made from boots digging in, the surface has dips and hollows all over the place, it’s a long way from a flat surface. The sod seems to to be lacking in grass to be honest, too much clay, not enough roots keeping it solid. 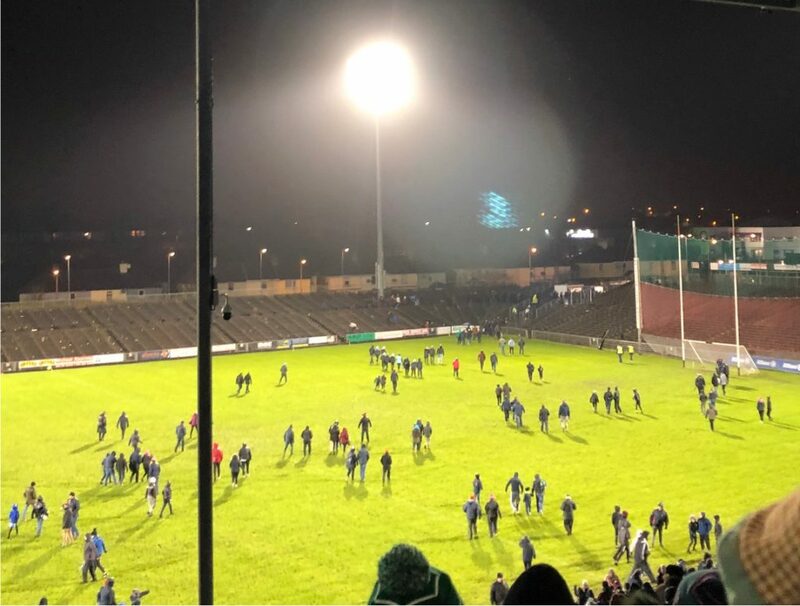 In fact, it seems very similar to when I played a NS hurling game there all of 30 years ago, when we struggled to lift the sliotar out of the holes in the ground. I’m far from a gardening or pitch maintenance expert, but if you look at any of the top grass playing surfaces, Croke Park, the Aviva, any number of Premiership pitches, they seem to have a sod with a high density of grass, and possibly roots below, which maintains its structure and you tend not to see the ground beneath at all. Should we be looking at replacing the pitch after we’re finished with inter-county home matches this summer? To me, the whole thing could do with being dug out, drained well, flattened completely, and a proper new surface laid. If we scrimp on the quality, we’ll be doing the same thing over and over again every few years. It would be best to do it once properly and let the team benefit from over the coming years. @MayoMark – There is absolutely no question whatsoever that Robbie’s kicks out are better than Clarke. Conditions against Roscommon were a factor in balls that when over sideline. 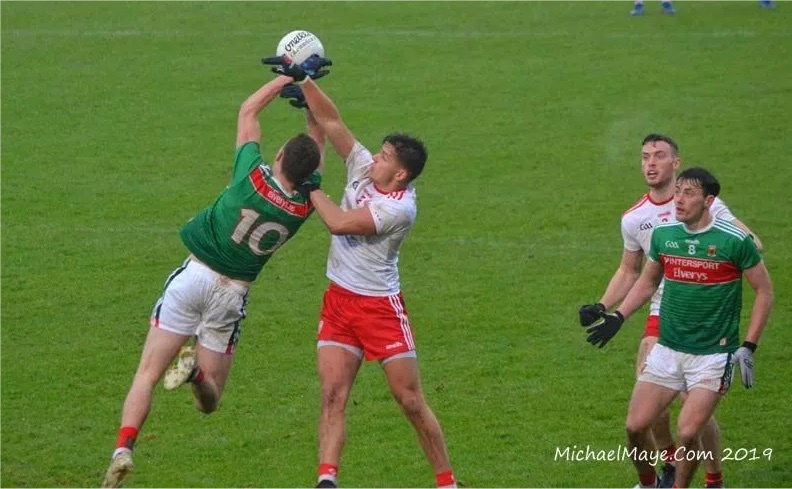 Not since ‘Bigbird’ came back to mind our square have I been confident in Mayo ability under high ball and that regardless what goalkeeper we have! I don’t have stats but anecdotally hasn’t Clarke conceded goals under high balls too (Derry match two years ago in particular stands out in my memory). Anyway, I find comparing these two a little distasteful as I’m a fan of both. They’re both wonderful goalkeepers and both have different qualities. Both given the right run in the Championship I bet would be all-stars contenders. AMayoFan – There is absolutely a question on kickouts. I have seen enough of both to know that. I’m not going to start trudging over old ground, because it’s not fair. But if we are going to completely deny numerous past events and refuse to learn from them then we are in trouble. They are not on a par. David Clarke is an All-Star goalkeeper, who was nominated once for player of the year. Even if his kickouts were inferior, and even it was by a significant amount (which, again, I do not think they are), we still can not afford to have someone of Clarke’s standard on the bench. We have worn that t shirt and it hasn’t worked. If Robbie was the best keeper in Mayo, I’d have no problem. If Robbie plays for Mayo, I’ll get behind him on the day just like everyone else wearing the jersey. But David Clarke is, on a whole, a much better goalkeeper. Just to echo Mayomad, Haunis, pitch laying is big, big money. It’s a massive investment. One that may well bee needed soon but one that will take serious funds. MacHale Park needs to be ripped up and a new pitch put in like they did in the Hyde…that may mean a year out for the stadium but in the long term it will be worth it. yew-tree, where will the money come from? I agree with Yew Tree – a new pitch is an absolute must and the sooner it’s done the better as the current one makes playing at home a major liability for us. Of course it’ll cost money, as will the Lough Lannagh development, hence our need to do fundraising like this. Because of the new rule, regarding all kickouts from there 20 m line, Hennelly has the ability to hit someone across the half fwd line. Clarke does not have this ability. Go back and review the last 10 minutes of the drawn all ireland 2016. Anyhow the decision is up to J Horan. To reply to Mayomad and MayoMark, of course it’s a huge expense, but it needs to be done, and the sooner the better. It’ll still be expensive next year or the year after if we keep putting it off. Generally though, this is something the GAA should be part-funding though. They’re happy to take the gate receipts from the inter-county games, but they should be ploughing it back to inter-county facilities. Now it may well be that we were waiting on the possibility of the Rugby World Cup coming to Castlebar in order to fund a new pitch, but as that’s not happening, it really should be one of the main items the County Board plan in the coming months. RiseAgain – That rule will be dumped in 4 games time so you can’t base everything on that. I don’t really want to get into this debate again, but Hennelly has had plenty of poor kickouts as well over the years. IMO it seems to be more of a concentration or mental thing with him. While he does have a cleaner kicking style than Clarke, he seems to struggle with decision making in game situations. From what I’ve seen, Clarke is better at shotstopping and under the high ball. The kickouts are broadly even. Clarke’s are more reliable/consistent while Hennelly has a better length/variety. Rise Again, refer to 2013, 2015 semi, 2015 semi replay, 2016 replay, if we are going down this route. I’ve said it before, it appears both keepers are judged on different standards. RE the pitch – I don’t disagree that it needs to be done. I’m just pointing out that it will require massive funds. On the pitch issue, the problem with relaying the surface is the sheer disruption it will cause. MacHale Park is used all year round, rom the FBD in January to the U21 club championships in December. If it has to be closed for a prolonged period of time where will all the games be played? Specifically the senior intercounty footballers. We get 10-14k at league games which cannot be accomodated anywhere else in the county. If the club championship finals were played in Ballina for example you would also get much lower crowds. Reduced crowds equals reduced revenue which adds more expense to the whole project. Wide Ball – regarding the re-org of games. I’m sure we could come to some arrangement with other counties to manage it. Let’s say we had a league season (2019) where we played all our home matches first, then resurface the pitch begins. We play all our Connacht Championship games away that summer, on the basis that we’d have them all at home next time around. We get to the Super-8’s and play our home game at an alternative venue, say Hyde Park or Salthill, just that season. Surely the pitch would be completed by the following season. Yes, you’d need to find alternatives to stage county finals, but I honestly think it would be worth it to get the pitch to the standard it should be. I’m a year behind myself, say 2020 League season home first, away last few games. I’m with you Mark on the keeper debate. Someone earlier said last year was a lost year in many respects and I’d agree too with that. We were out of juice in the league mainly because the on starting 15 in most games were the old reliables who had just come off two physically and mentally exhausting seasons. Thst we managed to stay afloat that day in Ballybofey was a credit to them team but there’s no reason why Reape and plunkett couldn’t have been nicely bedded in in 2018 and given Ruane greater exposure. From that perspective, I agree it was a year lost. These guys are 24,23 respectively and not kids anymore! Remember when Galway won Sam in 1998, a third of the team were 22 or younger!! I know Donnellan, Joyce, savage and divilly were all 21 yrs old cos and Meehan and Paul Clancy were 22. Yes, it’s a much more physically demanding game now twenty years on but it’s still relevant. High quality intercounty players should be ‘making it’ by the time they are 23. If they haven’t it’s unlikely they’ll develop into the the type of player good enough to win you an All Ireland. The ones who look certain to make it from our u21 2016 side are Diarmuid (obviously), Reape and plunkett (looks like a veteran already) and probably add Eoin O’D and Coen to that tho the former hasn’t featured this year and Coen needs to nail down a position. Ruane is being tested and boy do we need legs in midfield. We are really short in this sector. Akram hasn’t broken through. Hall has faded (I believe he has injuries but doesn’t look like he’ll be back anytime soon) and Boland still makes fleeting appearances. James Kelly plays the odd few mins here and there and Loftus…well, something ain’t right there. Still think he can make it but seems to have regressed and looks to lack strength, bullishness and aggression whereas look at Fionn Mcdonagh…he has really grabbed the bull by the horns and taken the opportunity (a bit like Jaydoc did in his first league campaign when he scored a heap of goals). Thst being said, Mcdonagh has to continue to improve. He kicked 2 wides v Cavan which should both have gone over. Loftus could take a leaf out of his book in terms of on the pitch mentality. James Carr…the great white hope…Andy namechecked him on newstalk and it was like the commentators curse!! No one seems to know where this guy is? I’d love to know if anyone has an update there. David Kenny and Liam Irwin were two excellebt players too but the boat may have sailed for both it seems. Pity. Particularly re Irwin cos he had a special talent and could react to do things others wouldn’t think of AND kick frees off the ground! Great if we can see more of disco and Ryan O D (When back from injury). They are young but not too young. Colm Moran needs to bulk up. I think everyone would like to see a new surface at McHale Park and it does need to happen at some stage. However significant funding will have to be in place first, approx 1 million would need to be ring fenced for the project. In reality Mayo play about 6 home games per year. Mayo County board have other demands on their finances, the stand still needs to be paid for (No money coming from GAA until that is done), the cost of training and maintaining teams is currently in the region of 1.5m and there is the development of Lough Lannagh to fund (IMO this takes priority). Taking that into account I would say the surfacing of McHale will be put on the very long finger. HaunisExile, I really don’t think County Council were waiting for the rugby world cup to finance it, that was all pie in the sky and was never going to happen in Ireland. We all love McHale park but it is no where near up to the standard required to host a world cup match. A good assessment of where we are at, however it is only Feb, and I hope it’s not a case of flying in February, burned out in June. I think we have big problems at midfield and if that doesn’t come into sharp focus against the Dubs next week, it will during the summer. On the goalkeeper issue, I think Horan will go with Robbie. A new surface in Mchale Park would mean a year away from it… The pitch is in better shape than it was this time last year, when it was definitely abused…. The two FBD match’s in January of last year ruined it and it never recovered, by the time we got to play Tyrone in the league it resembled Enniscrone Beach with all the Sand… Pairc Uí Cáoimh was resurfaced at great cost, and a total disaster… Serious questions should and indeed are being asked in Cork about the whole project including how much the new pitch cost, and why it’s so bad.. Enormous figures are being suggested for the resurfacing cost…But there is absolutely no reason for it to cost hundreds of thousands of Euro…It is still just over a hecacre of land, regardless if it’s the County ground or not….. Other GAA club’s, soccer club’s and rugby have resurfaced their pitchs successfully and it didn’t cost several hundred thousand Euro…If the surface is relaid, it would definitely mean a year away from McHale Park… Probably meaning that we play our league games in Ballina… Can Ballina hold the type of crowd’s Mayo regularly attract to home games? A few years ago I remember on an Easter Sunday, beautiful spring day in fairness, Mayo and Donegal attracted over 18K people in the league, Dublin and Mayo attracted a similar figure a few weeks earlier…. And that was official figures. Can the Mayo County Board afford the automatic reduction in attendance money this would nessarly involve?.. 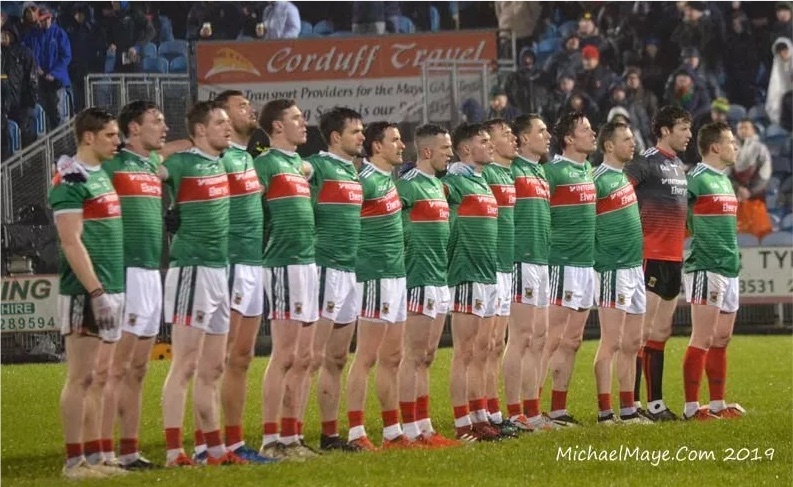 Another thing I would contend is that, while Mayo are probably the best supported team in Ireland, outside of Dublin… This continued support cannot be taken for granted, If thousands of Mayo fans were precluded from attending home games because of lack of capisity for one year, there is no gaurentee that they will return the following year….. Not too many years ago, Cork football had big support, Meath likewise, Galway once upon a time, long time ago… Even the Dubs are not coming out in the numbers of a few years ago…. 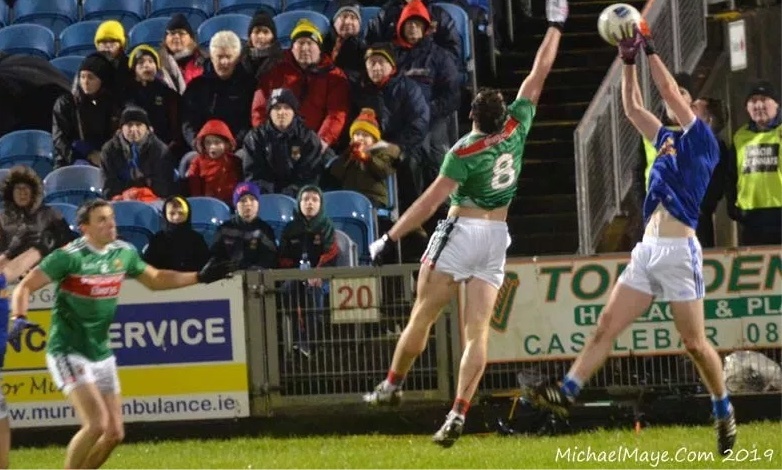 Mayo need to progress with caution! When did Cork footballers have huge support? Marty football has fallen off a cliff hence their support has reduced. Galway fans only ever showed up for All Ireland finals in my lifetime although Castlebar in 1998 was an exception…it was like they sensed it was going to be their year. That said there is no way we would get 10-15,000 at home league games if we were operating in division 2. Yew tree, I said ‘Galway,once upon a time, a long ago’. Cork in comparison to Mayo never had good support, but at least they did have some support….a multiple of what they now have, despite the new stadium, and I reckon that will be the same after they have the second new Pitch next year!.. You wouldn’t get 10,000 into any other Ground in Mayo!… Spending hundreds of thousands of other people”s Euro’s won’t gaurentee a good Pitch,. ..If it did, Cork would have a good Pitch in Páirc Uí Cáoimh… And even Wembley itself, was badly torn up after an American Football match was played their towards the end of last year…. Despite the millions available to the English FA and I’m sure spent…. What a good Pitch needs is very good care, good weather and time….All far more important than spending money on it! On the issue of the MacHale Park surface I have in the past few years been part of redeveloping my home club grounds which were by common consent “a bog, and nothing can be done wiith it”. It was on boggy soil and also subject to frequent flooding from an adjoining river. Today it is one of the best pitches for many miles around and has never failed to host a match since it opened over 10 years ago at any time of the year. The solution lay in drainage because, contrary to many peoples opinion, peat is one of the easiest soils to drain provided you can find an outlet for the water. It also involved laying a sand surface to make the surface more durable. The beauty of the pitch to play on is the springiness which makes it easy to run on and reduces wear and tear on the joints of the player. This comes from the peat soil. The secret of the drainage is a dual drainage system with drains about 5 feet deep at about 15 yards spacing and surface drains c. 18 inches deep and 12 – 15 inches apart with plenty gravel used. What the soil is like in MacHale I do not know. Would need to do a little digging to find out. But unless it has natural good drainage properties it will always be very difficult to have a good surface. Replacing the surface on a badly draining pitch would be a case of putting clean socks on dirty feet. The aroma won’t be absent for long. Another crucial aspect of doing work on a pitch is that any work done in bad weather is likely to leave conditions worse that at the start as working soil in bad weather destroys whatever structure is in the soil. So bad luck with weather could leave you pitch out of action for more than one year. PS to above. The cost of our redevelopment was c. €350,000 with one of the top, and in my opinion, the best contractors in the country. regarding the pitch are the seniors training on it at present.? For me, midfield is the place where we have the most to gain. I’d like to see us assured and confident there. I would love to see two people there capable of high fielding. In past years, I’ve seen the benefit of being able to gain possession there and make attacks from it. On the converse side I’ve noticed it is *really* costly for us to lose our own kickouts there, and for the opposition to win them. That is so wasteful and can cause all sorts of problems. Tom Parsons has been so good for us in this sector of the field. Seamus O’Shea too. This is top of my wishlist! Jp2 – I don’t think the seniors train in MacHale Park at this time of year. They would be on the back pitch. KMc`s goal for me ,for all the above reasons but also because we were sitting behind Tommy O`Dowd of Meath. He reveled in the whole Canalgate fracas. By the time the game was over he got more”benign” slaps on the back than were thrown in 96.